If you do not have a subscription to Ancestry, you can access their program online for FREE at most U.S. libraries. "Original voter registration lists were thought to be unavailable for Chicago and Cook County. Most of the old lists were supposed to be either destroyed or in warehouses, inaccessible to the public. However, in the late 1980s an amateur genealogist found 20 ledgers in the back room of the Voter Registration department at the County Building. 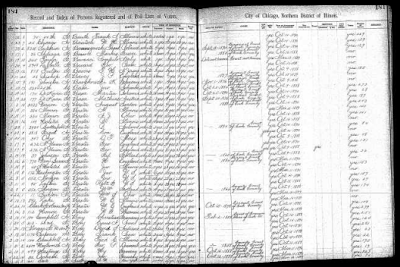 Recorded in these ledgers were several hundred thousand voters for the years 1888, 1890, and 1892, covering the city of Chicago and some other areas within Cook County, Illinois. The 1888 index covered the city of Chicago as well as the city of Lake View, town of lake, and the village of Hyde Park. These municipalities became part of the city of Chicago on July 15, 1889. The time period covered is very important because the 1890 federal census is not available, thus we have included this database in our 1890 Census Substitute Collection. The handwritten ledgers were microfilmed by the Illinois State Archives. Ancestry.com has used these 25 microfilm rolls to create an electronic index of this valuable collection. Fields in the original index include: name, nativity (country of birth), date and place of naturalization; term of residence in precinct, county, and state; current address. This electronic index lists name and nativity. Once a name is found you will then be able to view the electronic image of the index. Due to the age of the originals and/or the microfilming of the paper ledgers, many pages of the index were not legible enough to convert to electronic text, and have thus been omitted."